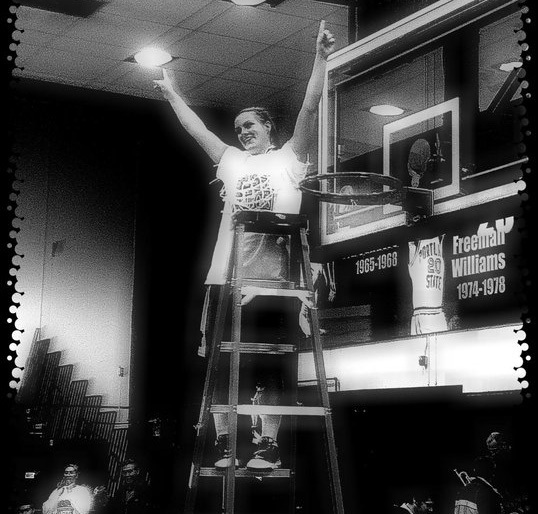 Senior guard Stephanie Stender was named Conference Tournament MVP after averaging over 13 points and 7 rebounds a game. Despite Montana’s rich history of NCAA appearances (18 coming into this season), much of this season didn’t look like another return was prominent for the ladies. Sure they had some bright spots during the season. The team rode the momentum from their upset over conference rival Montana State to a 6-game conference win streak during February. By the season’s end however, their endeavors were not as successful. The team dropped three of it’s final four conference games to close out the regular season, giving them a tough task as the #4 seed in the Big Sky Conference tournament. But apparently nobody mentioned anything about that difficulty to these girls… more likely they just didn’t care. The team cruised past Idaho State 66-53, took care of Northern Colorado 55-46, and then held on in the championship 62-58 over #1 seed Portland State in Portland. 1. Head Coach Robin Selvig hasn’t won over 700 games by luck. 2. The freshmen (such as Lexie Nelson, Jordan Sullivan, and Torry Hill) have been surprisingly clutch and ready to play. 3. Senior Stephanie Stender has been a consistent force for the team all season, and really took over some clutch/leadership roles in the conference tourney. So what’s next? UCLA on Saturday afternoon in the first round of the NCAA tournament in Spokane, WA. The contest will follow the early game of Saturday’s two-game session between No. 6 Iowa (22-8) and No. 11 Gonzaga (28-4). The Hawkeyes and Bulldogs will play at 2 p.m. (MT).The first-round winners will meet Monday at 7:30 p.m. (MT) for the opportunity to advance to the round of 16. Montana (18-14) is making its third appearance at the NCAA tournament in the last four years and the program’s 19th overall. UCLA (27-4), one of the tournament’s at-large selections, lost to just two teams this season: LSU and Stanford.UCLA is making its second straight trip to the NCAA tournament and its 11th overall. 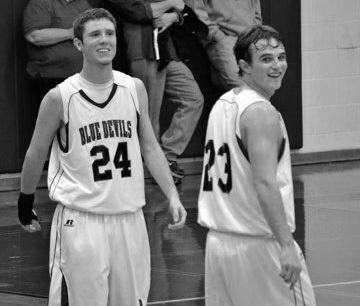 The fearsome duo of junior guard Riley Bradshaw (left) and senior guard Rodee Anderson (right) return to the State A Tournament. The term “career performance” is not a light phrase when it comes to the talented play of Corvallis’ Riley Bradshaw: but the junior point guard will be hard-pressed to find better days than he had last night. With a state tournament berth on the line, Bradshaw lit up the court for 41 points en route to Corvallis’ 71-56 win over Stevensville. He was 6-7 from beyond the arc and 11-13 at the charity stripe. The Yellowjackets meanwhile went just 5-22 from three as a team and thus played in their final game of the season. Josh Schultz led Stevi scorers with 19 in the contest. The Blue Devils take the #2 seed from the Southwest into Butte this week for the Class A State Tournament. The road goes uphill for the Devils who will face the defending State Champion Laurel Locomotives at 2:00 PM Thursday in the first round. Having covered Corvallis very closely this season, the Blue Devils have a definite chance to beat anybody and everybody at State. Stevi is a very talented team, but despite double-teaming Bradshaw nearly every possession he still found 41 points last night. Couple Bradshaw with the quickness and perimeter shooting that Rodee Anderson brings to the table and you have nearly unstoppable guard play. However Corvallis lacks a solid post presence, and that is a very large ‘Achilles heel’ to have. Their posts fight hard and know their roles, but they are undersized against nearly every team Corvallis faces. If the opposition allows Corvallis to execute their high tempo fast-break attack then their chances of keeping up offensively are slim to none. However if they focus on their transition defense and force the Devils to slow it down, they’ll have a chance. The biggest key will be rebounding: between Corvallis being undersized and their lights-out shooting, the opposition will need to utilize size advantage to limit the number of Corvallis possessions. Because if you give the Bradshaw-Anderson duo enough touches… they will beat you. Well okay… maybe that headline is getting a little carried away… but after going 2-0 against PAC-10 teams this season it certainly isn’t an unwarranted question (putting as at 3-1 against PAC-10 foes in the past two seasons). The UM mens basketball team took care of business at home last night against Oregon State 71-66 four a sixth win in our past eight games. This win comes less than two weeks after Montana’s convincing 66-57 victory over UCLA in Pauley Pavillion. To be honest, I’m not surprised at all by this early season successes. When the Griz are playing well I don’t see many teams we can’t contend with. Big man Brian Qvale is averaging over 15 points and 8 boards a game and is everything a coach can ask for as a defender and a leader. Qvale is also posting an impressive 3.6 blocks per game (as he approaches the all-time conference and team records for career blocks). Off the court he’s a great guy whom I had an opportunity to do a profile on earlier this month. Qvale locks down the post-game and is probably the most valuable big man in the entire conference. Meanwhile our point guard play out of sophomore Will Cherry hasn’t been too shabby either. He only leads the nation in steals with 4.2 per game and leads the team in scoring with 16 ppg. And he is a ridiculously good defender! I already gave you the steal numbers but he’s more than that. In our zone defense he’s all over every opponent on the perimeter. Last night against the Beavers he seemed to get a piece of a pass nearly every other time down the floor, and yet his crazy quickness comes with an equally impressive level of self control; he’s only averaging two personal fouls a game. The only possible thing the team can ask for more of from Cherry would be his numbers at the charity stripe as he’s making just 62% of his free throws through the first ten games of the season. The team as a whole is just a few free throws from posting an 8-2 record early on (close calls to Portland and San Francisco have us sitting at 6-4) and we’re still two weeks out from opening up conference play. 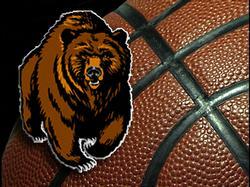 Keep your eyes on the Grizzlies… and a possible 2nd straight NCAA tournament appearance. Well the Montana Grizzlies are living up to their high expectations so far in this young basketball season… and what better way to continue doing so than to upset the UCLA Bruins in Pauley Pavillion? That’s exactly what the Griz did this past weekend (Sunday December 5th). Montana took a 4-point lead into halftime and led the rest of the way… finishing the game with a huge 66-57 win over the Bruins. Sophomore point guard Will Cherry continued his early season brilliance with 18 points and 5 assists in the game. 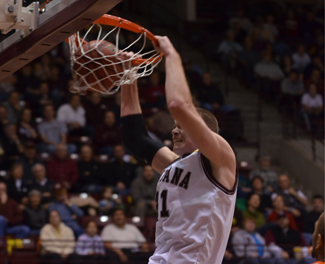 Senior post Brian Qvale added 13 points and 10 boards for his seventh career double double. The marquee victory was Montana’s first ever against UCLA in five total meetings. The win marks the second time in just two years that the Griz have defeated a PAC-10 opponent on the road. The win improves the squad to 4-3 on the year after early-season losses to tough teams in Nevada, Utah and Portland. Cherry continues to impress. The sophomore captain out of Oakland, California is averaging 17 points and a Big Sky best 3.3 steals per game in just his first season starting at the point guard position. Meanwhile Qvale continues to look like the best post in the conference averaging 14.6 points and 8 boards a contest. For the first time in 18 years, the Montana Grizzlies will not be competing in the FCS playoffs. The Grizzlies extinguished their chances of a playoff berth after falling to their rival Montana State 21-16 at Washington Grizzly Stadium yesterday. And although the team has plenty of excuses such as losing 17 seniors from last year’s team and undergoing a coaching and scheming overhaul, the team will most remember the untimely mistakes it made on a frigid November day against its bitter rival. Montana had three redzone turnovers, two of which came with 5-yards of the endzone. And so despite the Grizzly defense shutting out the Cats in the second half, Montana’s offense couldn’t find any points in the last three quarters of play. In another bitter storyline, senior runningback Chase Reynolds finished just three yards shy of the all-time Grizzly rushing record. Reynolds rushed for 180 yards and a touchdown in the game off of 21 carries. He finishes his brilliant collegiate career with 4,067 rushing yards. He also holds school records with 59 total touchdowns and 52 rushing touchdowns. Montana ended the game with slim hopes of getting an at large playoff berth into the 2010 FCS playoffs. Those hopes were dashed this morning when the selection show revealed a 20-team playoff bracket that did not include the Grizzlies. Between my busyness and my laziness it’s been tough to find motivation to post lately. I attribute a lot of it also to the fact that it’s tough to know when to post when there are so many work and sports related things going on every day… it all tends to run together. In KECI-related news, we’ve lost our fearless leader (sports director) Jake Zivin to a larger market as he’s now reporting in Eugene, Oregon. For the three weeks he was gone it was just Kayla (Anderson) and me holding up the sports department. However just a couple weeks ago our newest member joined the team from Fargo in Zach Borg. 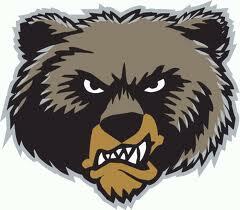 In the world of the Grizzlies we’ve had a tough start to the season following that wallop over Western State. We proceeded to lose our next two road games (to tough opponents in Cal Poly and Eastern Washington). Both losses were close games but the skid marked the first time since 2002 the Grizzlies had lost two straight regular season games. We’ve since recovered with wins over Sacramento State (28-25) and Northern Colorado (30-7). Unfortunately in the game against Sacramento State we lost Walter Payton Award candidate Andrew Selle for the season after sustaining a career-ending injury to his throwing arm (torn rotator cuff). The senior quarterback out of Billings (Billings West High School) ended his outstanding four-year career at Montana with a record of 14-3 as a starter. He is ranked 10th in school history in career passing yards (4,131) and in total offense (4,217 yards). Meanwhile, former Grizzly Marc Mariani reached a spectacular milestone this past Sunday against the Denver Broncos as the return man took a kickoff 98 yards for his first NFL touchdown. Unfortunately his Titans fell by a final of 26-20. Griz Nation hopes (and is confident that) the score is just the first of many for the outstanding athlete out of Havre, Montana. On a more personal note, I had the pleasure to meet and talk with sportscasting legend Brent Musburger today in the University Journalism school. He is one of the nicest and most sincere men I’ve ever met and it was a great experience to listen and learn from him talk about his career. Meanwhile I’ve also been busy making weekly video stories on various topics including everything from UM Baseball tryouts to a profile on Grizzly runningback Peter Nguyen. 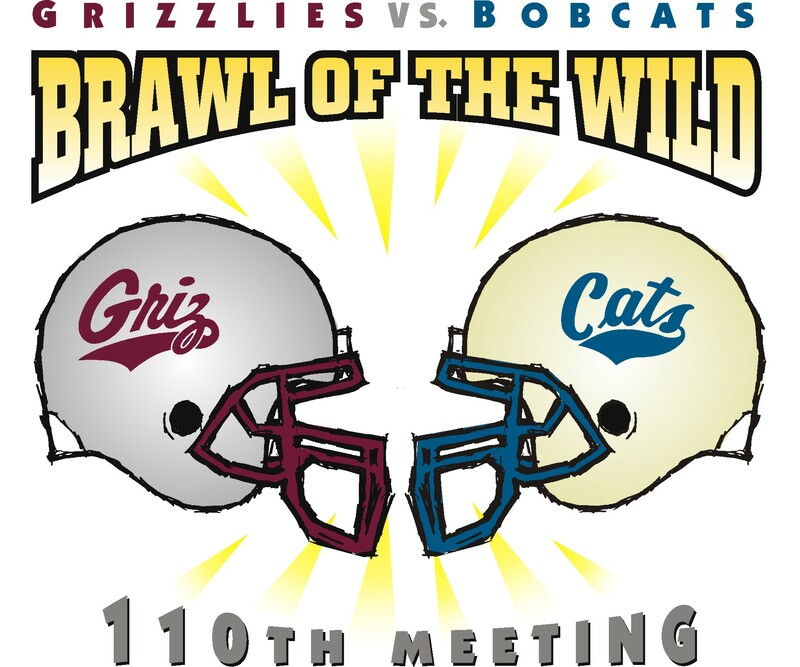 Coming into the 2010 season, things were very different for Montana Grizzly football. The team has a new head coach (Robin Pflugrad) and many new players, however one thing is the same from last year…they opened up their season hosting Western State College at Washington Grizzly Stadium. For the first time in my Griz football spectating career (which now totals 28 games), I spent the entirety of yesterday’s game on the field, shooting the game with Kayla for KECI. And the Grizzlies did not disappoint myself nor the home crowd. Montana was up 21-0 just minutes into the game and cruised to a 73-2 victory. The story of the day was the Griz defense giving up no points and scoring four touchdowns of their own, setting a Big Sky Conference record with four interceptions returned for touchdowns. Three of those pick sixes came in the first quarter as the team wasted no time demonstrating the speed and hands of their new look pressure defense. Another bright spot for the Grizzlies was the excellent return game by Peter Nguyen who totalled over 200 yards on kick and punt returns. Montana will face a tougher opponent next Saturday when they take to the road to face Cal Poly. Meanwhile a pair of ex-Griz football stars have officially made the cut for their respective NFL teams. Former Montana wide-receiver and Marc Mariani made the final Tennessee Titan roster yesterday. The Havre native led the entire NFL in all-purpose yards during the preseason with 440. His former teammate Shann Schillinger also made the cut with the Atlanta Falcons.